Silence. Stillness. My eyes and my mind confronted the stark reality of the black mirror, the dead and dark screen. 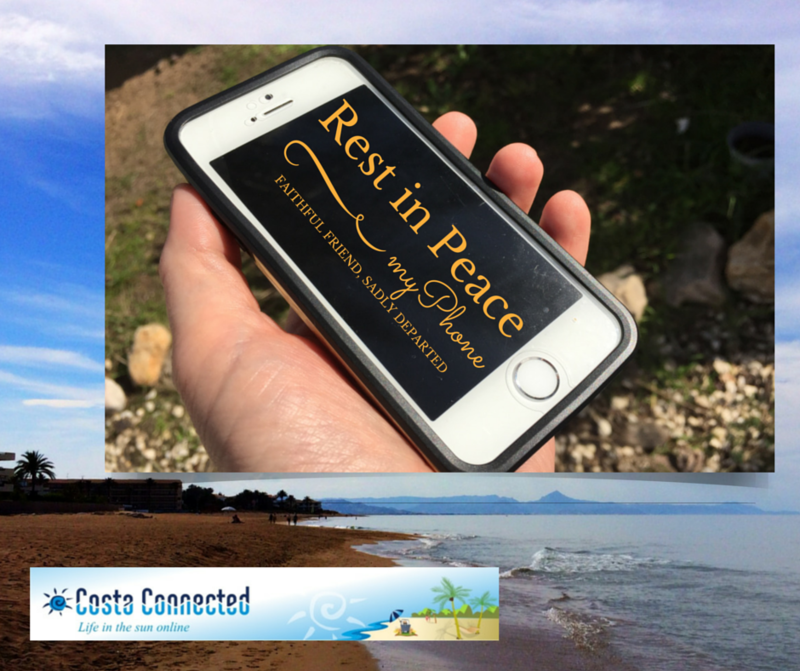 My phone, my faithful companion and business partner, lay silent and unresponsive in my hand. I guess I took its continual presence and support for granted, cared little for its needs and welfare. Whilst it was continually protected in state-of-the-art covers it was used to being slung into pockets and bags, used continually to run multiple demanding apps, its poor battery boosted sometimes several times per day when travelling and working at events. It never protested or let me down, so long as I kept its power needs satisfied it functioned without a blip for 18 months. It never occurred to me that one day it might not. Then, suddenly the screen froze, and promptly became totally unusable, randomly responsive… tap the number 9 and the 6 or the 7 flashed. Apps opened at random and could not be used. Crazy effects and actions started happening, and even tethered to iTunes it could not be reset or updated. RIP iPhone myPhone, I knew at that moment you were no more. However, I also knew that I was realistically several days from getting myself to the nearest Apple store to sob on the shoulder of a Genius. Between family and work commitments it wasn’t going to happen till the weekend, so I made my appointment, and then… waited. With no working phone. Now, I have probably used a mobile phone for something pretty much daily for at least 15 years – although the phone I was using back in the dark ages of the previous century obviously looked a bit different and was used for very little other than talking to people on. It’s surprising how little I do that on my current phone to be honest, I just do EVERYTHING else on it instead. How on earth was I going to manage? Work, for the most part, wasn’t overly disrupted. I was at home where my computer lives, not – thank goodness – on a trip. I still had my iPad for chilling out and ‘sofalising’ away from my desk, and now even phone-calls can be picked up on the iPad or Mac. All was surmountable during the day. But after work, then what? I went for a walk. I stepped away from my home wifi network… no point in taking my iPad, which doesn’t have a local SIM in it. Would I still exist? Disconnected, alone. I could get lost – no mapping or navigation apps. What if someone needed me? Am I really that self-important to think they would not survive for an hour, as we did for generations past when no-one had anything but a landline..? So I walked, alone and in silence. No music, no messages, no podcasts, no audiobooks. I walked by the sea and listened to the noise of the waves, and the breeze in the palm trees. Creative ideas came unbidden as my thoughts ranged freely – and I had no Drafts or Omnifocus apps to capture them in, I had to try and remember them. Tomorrow I must bring a notebook and pen, I will just set myself a reminder to… Oh. I will have to remember that too, in my actual mind. My only playlist was the soundtrack of my thoughts. My steps went uncounted, calories burned untracked didn’t seem to count towards any goals. I took no photos, checked in nowhere as I roamed. If the weather was about to change, as it does quite fast this time of year, my only notifications would come from the sky itself… and I would not be able to call a cab or check the bus schedule on Zoneamos. Did I become more mindful, centred, and alive? Not so much. Of course I have written much of the above with humour in mind, but I do genuinely use my phone for so many things that its absence was a big challenge. Any upsides? Well, I enjoyed the silence – and will take more walks with the sounds of nature again in future. I still prefer to know I am contactable or could contact people as and when I want to. And the story had a happy ending, thanks to the nice beardy people at the Apple Store in Valencia (the facial hair seems to be a prerequisite for a job in customer support there for some reason). Despite the phone having been purchased in the UK well over a year previously and right out of Applecare warranty, they somehow honoured the Spanish 2 year electrodomesticos terms on it and – after an abortive repair attempt – they presented me with a brand new phone completely free of charge. I will try not to take for granted again the tiny technological miracle I hold in my hand and depend upon so much!